A magnet always has a north pole and a south. The earth is also a magnet, it has a north and south pole. A material which has its electrons very aligned will have properties of magnetism. These properties include the ability to attract other magnets. 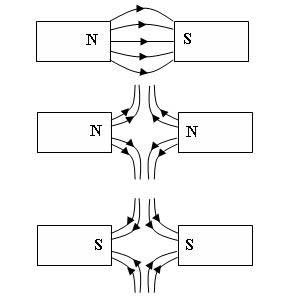 Opposite poles of a magnet attract (North and South/vice versa), while like poles repel (North and North or South and South). Magnetic substances (such as Nickel, Steel, Iron and Cobalt) can also be attracted by a magnet. Hard magnetic materials stay magnetised for much longer, soft magnetic materials don't stay magnetised. Magnetically soft materials are easy and quick to magnetise and demagnetise. They lose their magnetic properties very quickly once they have left a magnetic field. Magnetically hard materials keeps their magnetic properties for a long period time/permanently, magnetically hard materials are hard to demagnetise as they don’t lose their magnetic properties easily. You need to understand the term ‘magnetic field line’. A magnetic field is the area around the magnet where another magnet would feel a force. Magnetic field lines show the shape and direction of a magnetic field. The magnetic field goes from the North pole to the South pole. The stronger the magnetic field, the closer the lines are together. “Like charges repel, unlike charges attract.”, in this statement you can replace the words “charges” with “poles”, “Like poles repel, unlike poles attract”. If you try and put two North poles (or two south poles) together, you will find it difficult as they will slide to one side. This is because they are like poles and will repel as their fields are pushing away from each other, this creates a force that pushes them apart. By contrast, a North pole and South pole (or vice versa) will attract. The force will be an attractive force. Some materials that are not magnetic can become magnetic when they are in a magnetic field. This is a result of the magnetic field encouraging its electrons to align, forming north and south poles. This can happen in the four magnetic materials, nickel, iron, steel and cobalt.